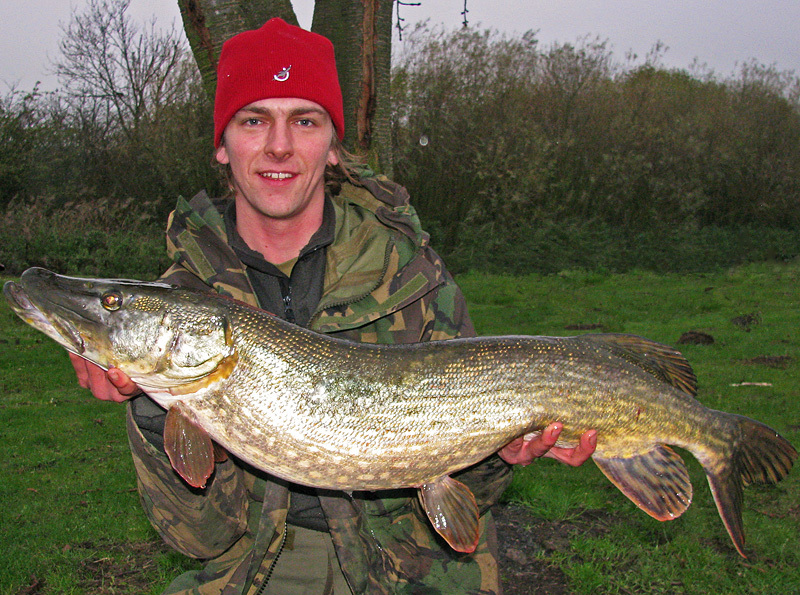 Andrew Kennedy's Angling Blog at Just-Fish.co.uk - Fishing Blog Coarse Fly Lure Pike Perch: Piking before the snow came and a timely review of some warm fishing gear! Piking before the snow came and a timely review of some warm fishing gear! As I write this entry, Derbyshire – along with much of the UK - is in the midst of snowy weather so severe that even the most ardent Toyota Prius driver must be wishing they’d bought a “gas guzzling” 4x4 instead! I would be surprised if many anglers are venturing out at the moment because this kind of prolonged cold period can turn most fish completely off the feed. Get ready once it warms up though (after the cold snow melt water has flushed out of the system) and you could be in for some action with very hungry fish! Without expecting anything like this weather approaching us, I managed to time it right and fished just a few days before the snow fell. I’d been lucky enough to receive a couple of products from outdoor gear manufacturer Sealskinz, to try out for fishing. I have owned their products before, which use a unique waterproof membrane to offer the wearer excellent resilience to the elements. My Sealskinz gloves have been used for everything from raft racing to caving and I’ve always been highly impressed by their function. 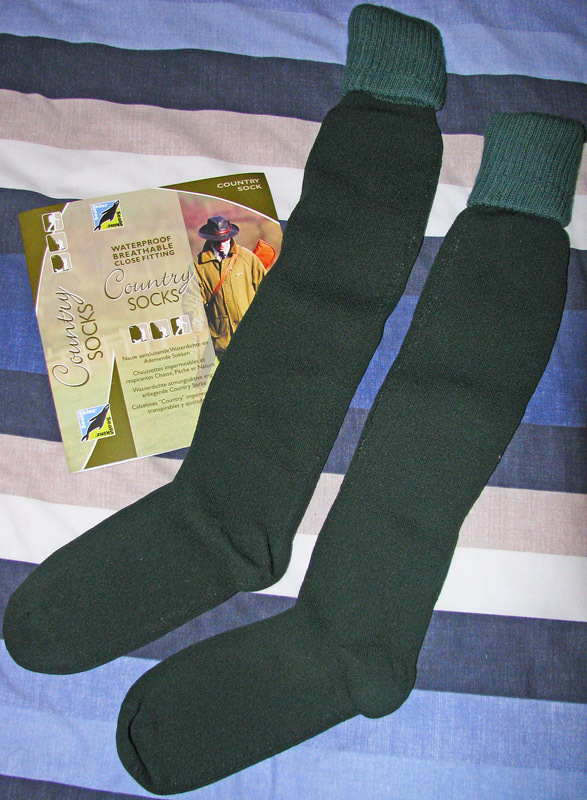 The new products I was trying out for fishing were a winter Beanie Hat and a pair of Country Socks, both incorporating Sealskinz’ patented waterproof, breathable membrane. 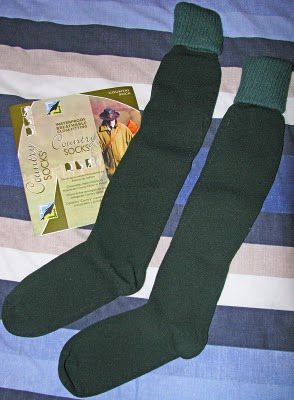 On first inspection, the country socks seemed a little on the thin side, but once I put them on I realised the benefits of their knee-height merino wool construction. They are surprisingly warm! They also feature an over-sized woolly cuff and are seamless all the way up to reduce blister-causing pressure points. At the end of a Winter session my feet are usually a damp mess, either from sweat or from water seeping in through my boots, but with these socks I can honestly say that my feet remained warm, dry and comfortable all day. Knowing that my legs were waterproof all the way up to the knee gave me confidence of trampling through long, wet grass, too. Perfect socks for fishing whether wearing wellies or boots. The beanie hat is not only windproof but waterproof too. It has a micro-fleece lining, making it very warm on the head. Having longish hair, beanie hats tend to ride up my head as I wear them, but the Sealskinz hat really seemed to hug my head and stay put. There was no rain to speak of on the day I tested the gear out, so I can’t vouch first hand for the hat being waterproof, but I’m convinced it will be, having experienced how waterproof other Sealskinz gear is. 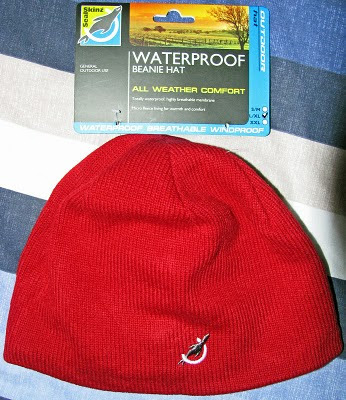 I think all fishing headwear should be made waterproof because you never know when you might be stuck outside when a storm breaks out, so this really is an ingenious feature. I would highly recommend these hats for winter fishing; they should keep you comfortable no matter what nature throws at you, whether on the bank of a drain or a boat on a reservoir. The hat I tested was red but they’re also available in black and olive. I’m sure you’ll be seeing this red hat feature in many of my future catch photographs (including the one below!). On the day it was great to be warm and comfortable because a cold wind was howling and the fishing was incredibly slow. I had arrived at dawn hoping to find some large shoals of bait fish that I could fish close to, but only the odd small fish made themselves visible, so I moved to an area I knew well, which had a few features to fish to. Initially I leapfrogged my rods, spending maybe half an hour in a swim before moving to the next, but gradually my confidence was slowly ebbing away; I had seen nothing to suggest there were any fish in the area, no bait fish activity and no pike striking either. Upon speaking to a bailiff, I decided to give another area a go, which I’d never seen before let alone fished. I was told no-one was down there and some pike had been showing of late, so it seemed the perfect chance for me to check it out. 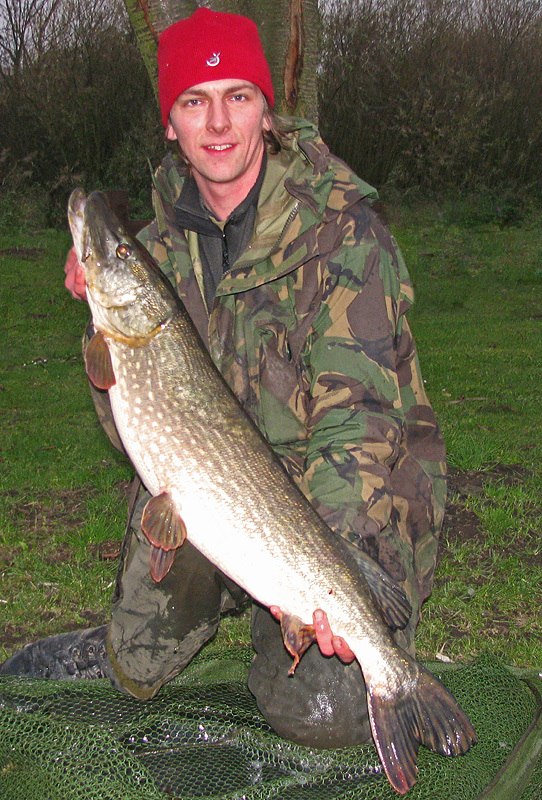 By the time I was packed up and headed the 4 miles or so to the new area, there was another pike angler set up and also guy after silver fish. 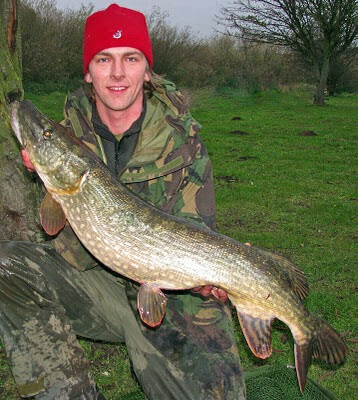 It looked promising and the guy bit-bashing said that the odd pike had been showing in front of some far-bank features, which I could see were surrounded by submerged weed. I cast one bait as close as I could and cast around with my other rod, to see if I could find myself some action. It was a chilly old day by this point and I was glad I’d taken an extra few layers, including the Sealskinz hat. I sat back, finished my sandwiches and flask of soup and contemplated what to do next. I was fishing with a roach deadbait on the rod cast close to where the pike had been showing; my theory being that if pike have been striking nearby, other pike may spot a natural coarse dead laid on the bottom and be less suspicious of it than a sea dead. On the other rod I alternated between smelt, mackerel and mini herring, hoping the added scent trail of an oil-injected sea dead might pull fish in from farther afield. I had just rigged up a wobbling rig for my lure rod and was making my third cast with this when a solitary beep from the roach baited rod caught my attention. I switched rods immediately and felt the line in my fingers; a couple of strong twitches told me it was time to strike. Immediately I could tell the fish was heavy; it kited to my right before I managed to turn its head, at which point it sluggishly swam towards me. As soon as the fish spotted the net in the clear water, it bolted and gave me a brief moment of worry because I’d seen it was a good size and I inevitably worried if the hooks would hold. My worries were unjustified because soon after the specimen was gracing my net. Just one of the barbless trebles was hooked and was easily removed. When I saw the girth of the fish, I was convinced it would be close to, if not over 20lb but the scales registered 18lb 14oz. This is the largest pike I’ve landed since my PB, which when I checked the date of capture, was exactly 5 years to the day! Guess it must be my lucky date! Spooky. I've also tweaked the layout of my website, www.just-fish.co.uk. The navigation menu is now at the top of the page, rather down the left-hand side. It looks a bit neater and dare I say, more "modern". Hopefully because it no longer uses frames either, it will be easier for people to link to the page they want or save to their favourites.